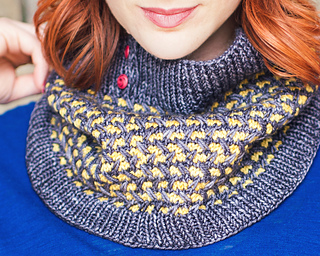 A textured cowl with a button placket and playful, slipped stitch colorwork pattern. Directions are provided to work the stitch pattern with stripes or without, creating two very different effects. The method used for the grey & yellow sample uses only slipped stitches for colorwork meaning you are only ever working with one color at a time. The teal & green sample has just one stranded round every 4th round making it an easy introduction to stranded knitting for a beginner. 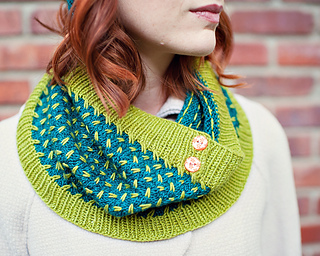 Pick up the matching hat pattern to make a set with reversed colors as shown in the photos! This pattern has a coordinating hat. 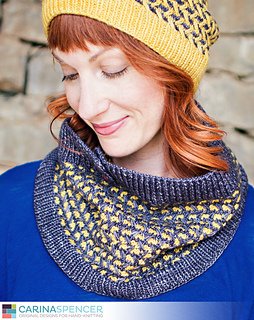 Purchase both the Opposite Day Hat & Cowl patterns and receive a $2 discount! No code needed and purchases do not have to be made at the same time, the discount will be automatically applied any time the second pattern in the set is purchased. One size to fit an adult woman. C1 - 190 yds (173 m), C2 - 105 yds (96 m). Green & teal sample was knit with The Plucky Knitter Traveler Sport (65% Merino, 20% Silk, 15% Yak; 320 yards/skein) in Buzz Lighter (C1) and Headboard (C2). Grey & yellow sample was knit with Madelinetosh Tosh Sport (100% Merino; 270 yards/skein) in Composition Book Grey (C1) and Subtle Grellow (C2). NEEDLES: 16 or 20” circular needle and one double pointed needle (dpn) in US 4 (3.5 mm) OR size required to obtain gauge. Cable needle. NOTIONS: 2 buttons about ½” in diameter, darning needle for weaving in ends.